After a less than perfect qualifying ride yesterday, only the fourth fastest, the New Zealand trio of Ethan Mitchell, Sam Webster and Eddie Dawkins blitzed their way to the bronze medal over the Netherlands. Their effort of 42.769s was their fastest ever – quicker than the gold medal ride at this year's world championships – and the fastest of this competition. Meanwhile the women's team pursuit made an encouraging return to the international scene to finish fourth, missing out to China in the bronze medal ride. The men's team pursuit produced a remarkable ride nabbing Denmark in the final 100m to claim fifth with the experienced Marc Ryan dropped after 2000m, suffering from a gastro bug that has affected a number of teams staying in their hotel this week. Meanwhile Cameron Karwowski lies provisionally in third place after three races of the men's omnium, while Racquel Sheath, in her first major international competition, was an excellent third in the elimination race to move to eighth overall with three events tomorrow. Sprinters Sam Webster and Matt Archibald did not progress in the keirin, missing out in the first round and repechage. The women's team pursuit combination of Rushlee Buchanan, Lauren Ellis, Jaime Nielsen and Georgia Williams, who qualified second fastest yesterday, were beaten by Canada in the semifinal this morning. They faced the much improved China who proved too strong with a 4:23.911 effort to claim the bronze ahead of the Kiwis who rode an encouraging 2:26.10 to finish fourth, with both teams faster than the beaten finalist Canada. "It was fantastic for the girls. They know they have a lot of work to do but they have realized that they are up there with the best in the world which is encouraging considering they have been out of international competition in this discipline for two years," said BikeNZ head coach Dayle Cheatley. The men's team sprint trio of Ethan Mitchell, Sam Webster and Eddie Dawkins were unhappy with their qualifying ride yesterday but made up for that today in the ride for the bronze medal against the Netherlands. Mitchell set them on their way with a 17.237sec first lap from the standing start, the fastest in the competition, and Webster took them through the second lap in 29.852s with a 0.2sec advantage. Dawkins, who was not at his best yesterday, nailed the final lap with a 12.817sec effort, the fastest of all man-three riders today. While Great Britain claimed the gold from Germany, the Kiwis still laid a marker for the rest of the season. "They were a bit disappointed with their qualifying ride but to their credit they came back today and showed the rest of the world what they are capable of doing. They will be looking to step up over the season," said Cheatley. The men's team pursuit competition was the tightest in recent memory with 10 teams all within two seconds of eachother, with winners Australia the standouts. The New Zealand team just missed out on a medal ride. The fifth fastest qualifiers beat Spain in the first round today, but lost momentum in the last kilometre when they had to overtake their opponents on the bend. They managed an excellent 3:58.685 but it was a second slower than Germany and Switzerland who contested the bronze medal ride. Australia, who posted two rides in the 3min 55sec range, were a class above to beat Great Britain comfortably in the final. New Zealand trailed Denmark throughout in the ride for fifth. With an ill Ryan bravely managing 2kms, it was left to the remaining trio of Pieter Bulling, Aaron Gate and Westley Gough to respond. They edged their way back with Gough, making his return to the international track scene, producing a superb final lap to guide the Kiwis to the win by 0.1sec. 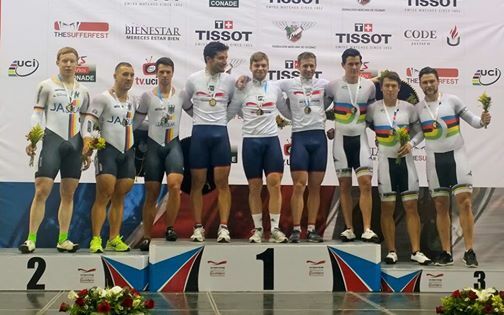 "The men's team pursuit depth is incredible, perhaps the strongest I have seen," said Cheatley. "We were happy to come away with fifth place, with all rides well under four minutes and all of them done losing a rider at the 2km mark, with Marc Ryan unwell." In other racing, Cameron Karwowski was third in the scratch race and 10th in the 4000m individual pursuit to start the men's omnium competition. In the women's omnium, debutante Rachel Sheath was 10th in the scratch and 13th in the 3000m individual pursuit. Tomorrow's final day features Dawkins and Webster in the men's sprint, Stephanie McKenzie in the women's keirin with Karwowski and Sheath in the second day of the omnium. Results: Men Team Sprint, bronze medal ride: New Zealand (Ethan Mitchell 17.237, Same Webster 12.715, Eddie Dawkins 12.936) 42.769, 3; Netherlands 43.098, 4. Gold medal ride: Great Britain 43.092, 1; Germany 43.106, 2. Men 4000m Team Pursuit, Gold Medal ride: Australia 3:55.976, 1; Great Britain 3:58.129, 2. Bronze medal: Germany 3:57:828, 3; Switzerland 3:57.867, 4. Also: New Zealand (Aaron Gate, Pieter Bulling, Westley Gough, Marc Ryan) 3:58.844, 5. Denmark 3:58.951, 6. Women 4000m team pursuit: Gold Medal: Great Britain 4:21.256, 1; Canada 4:26.122, 2. Bronze medal ride: China 4:23.911, 3; New Zealand (Rushlee Buchanan, Lauren Ellis, Jaime Nielsen, Georgia Williams) 4:26.146, 4.